The forward shoulder position is a common postural alteration that contributes to a variety of issues including, but not limited to, range of motion deficits in the shoulder and neck, faulty mechanics of the shoulder complex and impingement syndromes. In part I of this article, I discussed that optimal alignment of the scapula is in upward rotation and posterior tilt and that the forward shoulder posture is characterized by downward rotation and anterior tilt of the scapula. If starting alignment is not improved, an over-reliance of scapular retraction exercises will often perpetuate scapular positioning in downward rotation and anterior tilt. If you missed Part I of the article you can access it here. 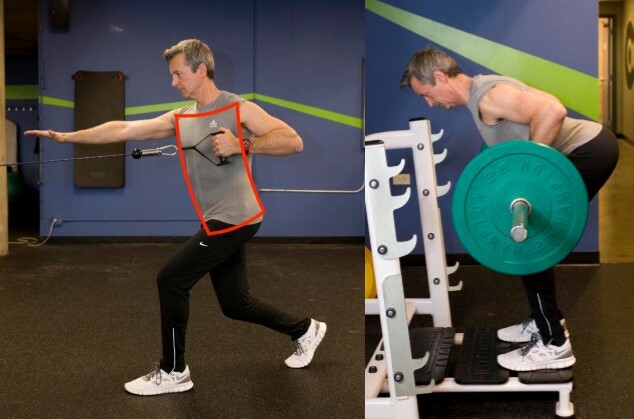 In this article, I am going to follow up that discussion and demonstrate how to integrate optimal shoulder alignment and control into pulling patterns so that you are able to improve both static positioning and more importantly, function in your clients with the forward shoulder posture. develop improved stability and function of the shoulder complex in individuals having the forward shoulder posture. In part I, we discussed that in an attempt to make it easy for the client to understand and perform, the rehabilitation and fitness industries have over-simplified scapular mechanics, particularly the concept of retraction. Subsequently, individuals with forward shoulder positioning have been classically cued to contract their rhomboids and middle trapezius by squeezing their shoulder blades ‘down and back.’ Before I truly understood scapular mechanics and experienced my own shoulder problems, I would use similar creative cues such as ‘imagine that you are squeezing a pencil between your shoulder blades’ during the concentric phase of both my and my patient’s pulling patterns. Unfortunately, many of these types of cues are still commonly being taught and used in rehabilitation and fitness. In their defense, scapular retraction may be appropriate for individuals who already have optimal scapular alignment in upward rotation and posterior tilt and simply have slightly exaggerated protraction of the shoulder complex. However, clients who present with optimal alignment and control of their scapula, yet demonstrate slight protraction of the shoulder complex, generally don’t need to change their strategy. With these clients, I don’t cue them to do anything different during their patterns, unless at some point they lose upward rotation and/or posterior tilt of the scapula. Retraction-biased cues however, are completely contraindicated in most individuals with the forward shoulder position because, as we previously discussed, the majority of these individuals are not in optimal alignment; their scapulae are in downward rotation and anterior tilt. Therefore, retraction dominant cueing during pulling movements will simply drive the scapula into further downward rotation and anterior tilt while training dominance of the scapular retractors (rhomboids and middle trapezius) and often the downward rotators (levator scapula and rhomboids). As we previously discussed, these cues will also disrupt optimal scapular timing and perpetuate shoulder dysfunction especially during initiation of flexion or abduction movements of the shoulders and during the eccentric phases of the motion (Osar 2014, Osar 2016). Refer back to the previous article for further discussion on the previous points. Pulling patterns are used to develop the scapular retractors (rhomboids and middle trapezius) as well as the shoulder extensors (primarily the latissimus dorsi and posterior deltoid). Pulling patterns should also reinforce development of the scapula upward rotators and posterior tilters (serratus anterior, upper and lower trapezius). Optimal mechanics of the scapula will be discussed using the cable row and the pull up as respective examples of horizontal and vertical pulling patterns. Recall from part I that the scapula should ideally rest upon the thorax in slight upward rotation (where the inferior angle of the scapula is slightly more lateral or further away from midline as compared to the superior angle) and posterior tilt—a position where the inferior and anterior surfaces of the scapula gently hug the posterior aspect of the rib cage (Sahrmann 2002, Osar 2016). Although this alignment will vary slightly depending upon the activity and direction of force, ideally the scapula should remain in relative upward rotation and posterior tilt during most exercise patterns (Osar 2016, Osar 2012). As discussed, in individuals with forward shoulder posture, there will be a dominance of the muscles that downwardly rotate (levator scapula and rhomboids) and anteriorly tilt (pectoralis minor) the scapula. In these individuals, the lower fibers of pectoralis major and latissimus dorsi will additionally contribute to this non-optimal positioning and subsequent altered control during pulling patterns. As the arms are brought forward through the eccentric phase of a rowing type motion, the scapula should abduct and ‘wrap’ around the thorax. The term wrap implies that the scapulae remain controlled against the thorax in slight upward rotation and posterior tilt. As the individual pulls their arms back in the concentric phase of the motion, the scapulae adduct and they are brought back to their original resting position. See images below. During the eccentric phase of a rowing pattern the scapula should ‘wrap’ (abduct) around the thorax (image above left). During the concentric phase, the scapula should adduct back to their original resting position (image above right). The scapula should remain in upward rotation and posterior tilt throughout the pattern. Notice the scapulae abducting around the thorax during the eccentric phase of the horizontal cable row pattern (image far left). During the concentric phase of the pattern, the scapulae adduct back to their starting neutral position and remain in slight upward rotation and posterior tilt (image near left). When re-training optimal scapular alignment and control, it is often beneficial for the individual to maintain space between their arms and their trunk as they pull (image near left). This position helps facilitate a widening through the front of their shoulders and keeps them from over-adducting their scapula. A common cue we use with our clients is to feel as if they are pulling the front of their shoulders ‘open and wide’ as they row. It is common that clients with the forward shoulder position will overly adduct their scapula during the concentric phase of a rowing pattern. Notice the overly adducted position and over-activity in the levator scapula (arrow in image to right) in this client who struggles with controlling her right scapula during her pulling patterns. Subsequently, she experiences trigger points in her levator scapula and rhomboids and chronic right-sided neck tightness. To improve upward rotation and posterior tilt, individuals with over-activity in their scapular adductors—as well as their downward rotators and anterior tilters—are cued to pull their shoulders ‘open and wide’ versus ‘down and back’ during their pulling patterns. The individual should also maintain a stacked thoracopelvic cylinder and not hyperextend from their thoracolumbar junction during rowing patterns (images below). Their thorax should remain stacked over their pelvis in neutral alignment whether performing a seated, standing or bent-over rowing pattern. They should maintain a neutral spine position and feel as if they’re being pulled along from the back of their head. Another common issue in individuals with the forward shoulder position is that they are often cued to ‘lift their chest’ as they pull. In addition to over-retraction and depression of the shoulders, this cue often results in hyperextension at the thoracolumbar junction (arrow in image below left). To maintain alignment of the thoracopelvic cylinder and support optimal scapular positioning upon the thorax, the individual is cued to maintain a stacked cylinder and a long spine position as if they are being pulled from the back of their head as they pull (image below right). During a vertical pulling pattern such as a pull up or cable pull down exercise, the scapula should wrap around the thorax and move into further upward rotation and posterior tilt through the eccentric phase of the pattern. During the concentric phase of the rowing pattern, the individual retracts their shoulder complex so that the scapula moves back to the initial resting position of the shoulder complex (i.e. back to the beginning, neutral posture). Similar to the horizontal row, they should not be cued to fully adduct their scapula (squeeze them together) because, as we discussed above, this over-recruits the scapular adductors and doesn’t train them in their role of maintaining optimal alignment and control of the shoulder complex (Osar 2016, Osar 2012). As the arm moves overhead through the eccentric phase of a vertical pulling pattern, the scapula should move further into upward rotation (image far left) and posterior tilt (image near left). Tightness in the scapular downward rotators (levator scapula and rhomboids) and anterior tilters (pectoralis minor) as well as the depressors (latissimus dorsi and lower fibers of pectoralis major) can inhibit optimal overhead motion leading to compensations. Also note how the individual is able to maintain optimal alignment of her thoracopelvic cylinder as she raises her arms. It is important to ensure that the individual does not compensate and hyperextend at the thoracolumbar junction to get their arm into a fully vertical position if they don’t have the prerequisite range of shoulder flexion. The scapula should return to the starting neutral position versus being overly adducted during the concentric phase of the vertical pulling pattern. 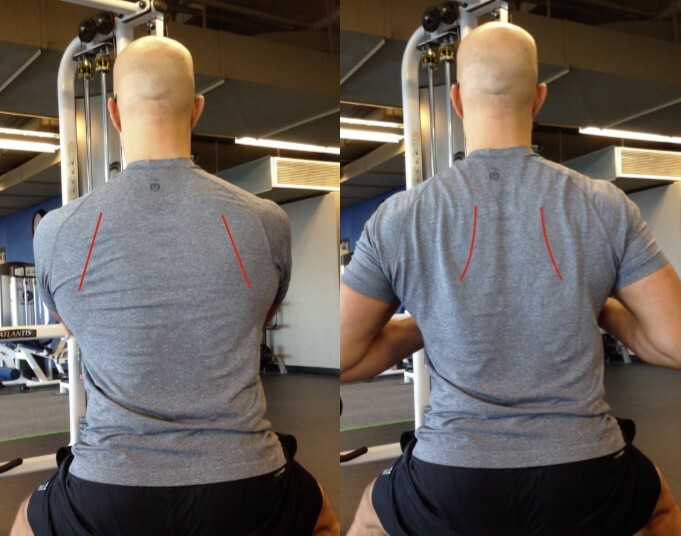 During the eccentric phase of vertical pulling patterns, the scapula wraps around the thorax and should be controlled in upward rotation and posterior tilt (red lines in image below left). Notice that during the concentric phase as the individual pulls himself up towards his hands, the scapula adducts back to the resting position of the scapula yet remain in upward rotation and posterior tilt (red lines in image below right). When horizontal and vertical pulling patterns are performed in the manner described above, the individual is training the scapular retractors to work with the scapular protractors in control of the shoulder complex and maintain the scapula in upward rotation and posterior tilt. In other words, our client’s movement patterns are reinforcing optimal scapular alignment and mechanics and are not forcing the individual to adopt a non-optimal alignment or control strategy. Inevitably, when discussing the topic of pulling patterns, the question that should arise is whether there is ever a time when training full shoulder retraction (pulling the scapula into end-range adduction) is warranted. When the individual you are working with has demonstrated optimal alignment and control in both static positions and during dynamic activities, there is absolutely nothing wrong with training full shoulder retraction. However, when the individual is struggling with alignment and control of their scapula and their strategy is manifesting in chronic neck, shoulder and/or upper thoracic dysfunction, the over-riding goal is to initially teach them where neutral alignment is and how to control their scapula during all their functional movement patterns. Once they develop and demonstrate a more optimal strategy, they can be strategically trained utilizing full shoulder retraction. In this two-part article, we have discussed how all the muscles of the shoulder complex work synergistically to maintain the scapula in slight upward rotation and posterior tilt during both static posture and dynamic movement. The serratus anterior, upper and lower trapezius will upwardly rotate and posteriorly tilt the scapula while the levator scapula, rhomboids and pectoralis minor will downwardly rotate and anteriorly tilt the scapula. Upward rotation and posterior tilt of the scapula should be relatively maintained during both static posture and during dynamic activities. The forward shoulder posture occurs when there is a dominance of the downward rotators and anterior tilters of the scapula. This non-optimal alignment strategy is perpetuated during many pulling patterns, especially when the individual is cued to overly use their retractors during the concentric phase of the patterns. Hence, the non-optimal posture is perpetuated by a non-optimal movement strategy. Over-dominance of the scapular retractors becomes a problem because it disrupts optimal shoulder mechanics especially during initiation of overhead motion and during the eccentric phase of shoulder motion. The principles of the Integrative Movement System—alignment, breathing and control—provide a framework for restoring optimal alignment and control of the thoracopelvic cylinder and the scapula in relationship to the thorax. The individual must align their thoracopelvic cylinder and control their scapula relative to their thorax during pulling patterns. The scapula should move further into upward rotation and posterior tilt during the eccentric phase and return to the starting neutral alignment during the concentric phase of pulling patterns. Only when the individual demonstrates optimal alignment and control of the thorax and shoulder complex should they be encouraged to perform full retraction of the shoulder complex during their exercise patterns. When you help your patient or client develop and reinforce optimal alignment and control and reinforce this through their functional movement patterns, you are providing them with a strategy for successfully achieving their health and fitness goals while decreasing their likelihood for developing and/or perpetuating their habitual compensations. In a future article, I will discuss how to integrate upward rotation and posterior tilt of the scapula into pushing patterns.